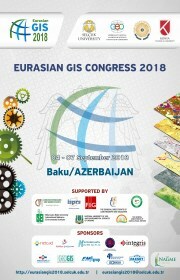 The Euroasian GIS 2018 Congress was held on September 4-7 in Baku. I joined the Congress as Vice President of FIG. I made the opening speech on the opening ceremony on 4 September 2018. Approximately 300 people attended the congress. It is necessary to implement works on identification and prevention of different problems through taking big advantages enabled by Geographic Information Systems, usable in analyzing sustainable socio-economic development of regions and countries. Congresses in this direction confirm that this event can play a significant role in the establishment of scientific, economic, political and cultural relationship between the countries in the field of scientific cooperation and communication among scientists and specialists of the region, as well as discussing the acquired scientific and experimental materials. One of the attributes of the implementation of the orders and instructions of the President of the Republic of Azerbaijan Ilham Aliyev on the establishment of e-government in the country, the structure of spatial data and their placement on government portals is the development of GIS technologies throughout the country, the study and the application of theoretical issues of these technologies in practice. 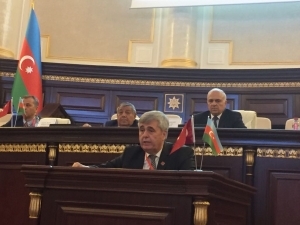 Relatedly, the held Congress was focused on the discussing and sharing of practical issues and carrying of innovative analysis in the field of Geographic Information Systems, as well as the combining of efforts of the representatives of science and research, representatives of the NGOs and government entities. Improvement of geographical information systems, spatial database structures and spatial analyses by carrying wide scientific researches and also relevant tuitions and trainings at the level of modern requirements, as well as conduction of training of highly qualified personnel is needed. The role and application of GIS analyses in prior revealing of threats and preventing of disasters must be considerably promoted, with based on use of environmental monitoring, as well as management of natural disasters and natural resources. Establishing a database and contributing to development of agricultural branches through applying GIS analyses in researches on land resources, water and climate, as well as cadaster issues, land planning and management would favor the increasing of the share of non-oil sector within national economies, and particularly in Azerbaijani economy. Conduction of studies on climate change, tectonic movements, desertification and other global problems makes necessary to foster works on establishing the international database with using the GNSS methods, remote sensing and geodetic measurements. 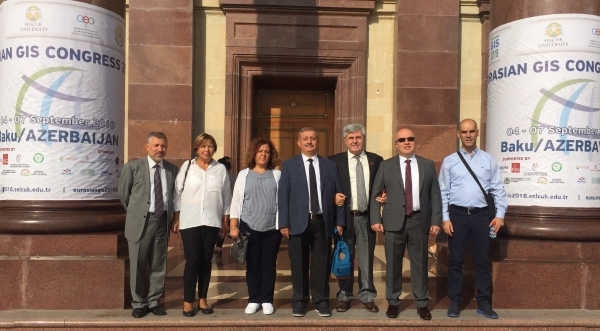 FIG Vice President Orhan Ercan together with the Turkish delegation at the Congress and Prof Dr Ferruh Yıldız, co-Congress director, standing to the left of Orhan Ercan. Turkish delegates included Sedat Bakıcı, head of the Department of information technologies at central cadastre organisation, Mert Yasin Öz, GIS branch head at cadastre and to the very left Dr Muzaffer Kahveci.